Those of you who know me know that I have been moving into my new house over the last few months. Officially moving in around the beginning of December, it’s still taking shape and plenty of work to do. Thanks Antoinette! Excellent, it is an LFC air freshener. I don’t mind Arsenal so I hope the Champions League goes well for you. But better for us of course! Nice looking office Joel! Good luck with the remainder of the move. Ah #4 is from British comedy sci-fi show Red Dwarf. There’s an itsy bitsy action figure on the right side of the shelf with the paperback novels. I can’t figure out who or what it is. Ah yes, that’s #3 well spotted. The street sign is #2 behind it. You’re close with #4 though it is very hard to see, I’ll keep you in suspense for a while longer! With the picture expanded, I see the itsy wooden Big Ben. When the pic was smaller, I thought the stained glass was a wide shot of a football crowd.=:-D Call me, Ms. Magoo. Over to the left looks like a little monster/dinosaur action figure. Did you watch Primeval? Is that a stretch? @Ryan – The chair is a highlight! 2. Click the image to expand and bang in the centre is something obvious, in fact two things if your eyesight is good. 4. Need another (British) sci-fi fan to spot this. 5. Need a keen eyed soccer fan! @CM Thanks! Yes it’s always this neat… I tried to explain to my wife that yesterday some wild pigs broke in and targeted just the office, but for some reason she didn’t believe me! Ah a man after my heart, a nice tidy office. Looks great Joel, I especially like the plush “captains” chair. I found the obvious nod to England, the red phone booth. I am stumped on the other four. 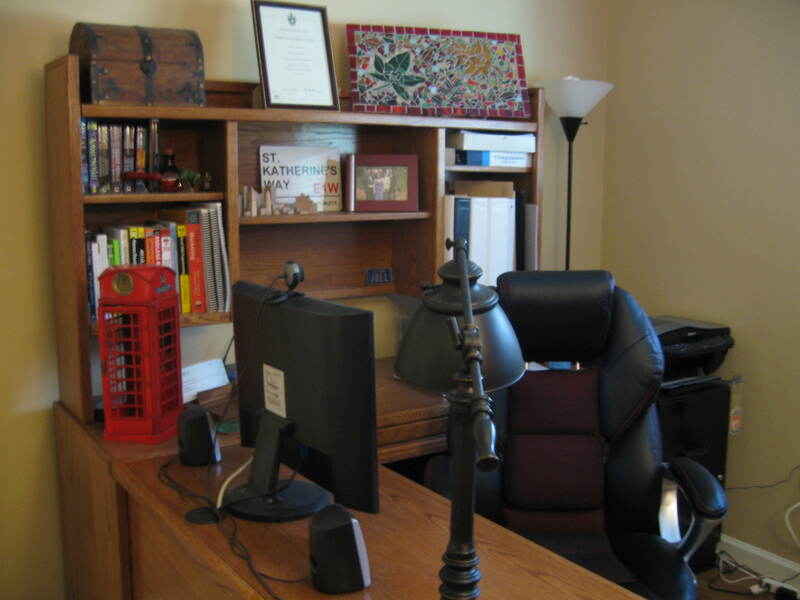 Wow – your office looks gorgeous (and neat.) I spotted the red call box right off the top, although if you’d had a blue one, I’d think you were a big Dr. Who fan. Not that there’s anything wrong with that. I hope you’re not terribly homesick over here. Next Next post: How Do You Measure Your Blog's Success?